Family says pathologist says her "lungs were 100 percent congested"
SEATTLE, Washington (CNN) -- A pathologist hired by the family of one of two women whose mysterious deaths in Thailand drew worldwide attention says her "lungs were 100 percent congested," Jill St. Onge's fiancee and brother said. Jill St. Onge died while vacationing with her fiance at a Thailand resort. "He said her lung tissue was gone," said her brother, Robert St. Onge. The pathologist has not determined what caused her lungs to fail, he said, and a final report on her May 2 death may still be weeks away. But members of St. Onge's family said they feel the pathologist's findings, though preliminary, are enough to contradict public statements made by Thai investigators that St. Onge was the victim of food poisoning. "I am 99.9 percent sure she did not die of food poisoning," said Ryan Kells, St. Onge's fiancee, who was with her when she died. "She suffocated to death. I am not a doctor, but I know when someone can't breathe." Kells and St. Onge, both artists from Seattle, were on a three-month vacation through Southeast Asia when they arrived on Thailand's Phi Phi Island. They had gotten engaged while on the trip and were keeping friends and family up to date with their adventures. "Having a blast," Jill St. Onge, 27, wrote about the surroundings in a blog dedicated to the couple's travels. "Food, drink, sun and warm waters ... what else do ya need?" The couple's vacation ended tragically when Kells found his fiancee in their hotel room vomiting and unable to breathe. He rushed her to a hospital where she died. 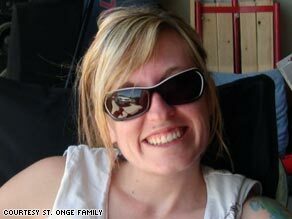 St. Onge was healthy and there was no obvious explanation for her sudden death, her brother said. Just hours after St. Onge fell ill, Julie Bergheim, a Norwegian tourist who was staying in a room next to St. Onge's at the Laleena Guesthouse, came down with similar symptoms. She also died. According to Thai media reports, police there are focusing on food poisoning as the cause of the women's deaths. On Monday, the Phuket Gazette quoted a police commander as saying blood samples from both women indicated possible food poisoning from seafood. Still, the commander said, those results were only preliminary. "I don't know when the official results will be released," Maj. Gen. Pasin Nokasul told the newspaper. "The lab work [is being] expedited because the embassies of the two tourists want to know the cause of death as soon as possible." Kells response to Nokasul's statement was harsh. "That she died of food poisoning is a ridiculous statement to make," he said, adding it is unlikely they would have been "the only ones affected." Dr. William Hurley, medical director for the Washington Poison Center, is also skeptical that food poisoning could have been responsible. In food poisoning cases, he said, "usually what kills you is the dehydration, not the toxin." He added, "Food poisoning is not something that typically kills someone this quickly. It takes days." Ingestion of a variety of chemicals could have caused Onge and Bergheim's sudden deaths, Hurley said, and could be consistent with the condition of Onge's lungs. But without further information, he said, it is impossible to say what killed the two women. Kells said he thinks something in the hotel where they were where staying made Jill sick. He remembers a "chemical smell" in the room and thinks he avoided becoming ill because he spent less time in the room. On Saturday, the Phuket Wan newspaper reported that investigators visited the Laleena Guesthouse, taking samples and removing filters from the air conditioning units in the rooms where both victims had stayed. Rat Chuped, the owner of the hotel, told the newspaper her property was not to blame. "There is no problem with my guesthouse," she said.